Song of the day: Origami Hologram – "Ghost Horse"
Ultra-friendly American music-makin’ chappy Justin Kline (Hi, Justin!) 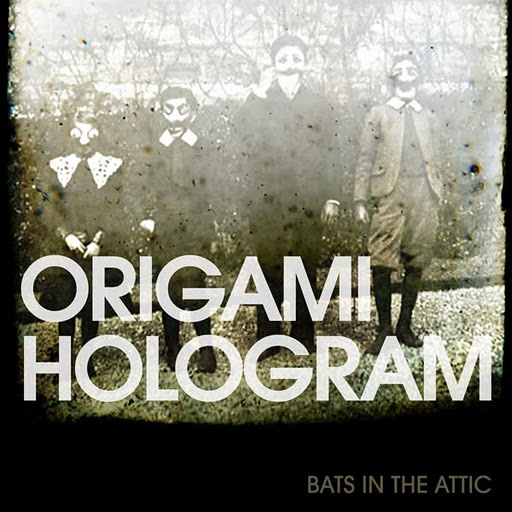 sent me an email to let me know that he’s currently in a three-piece band called Origami Hologram, and they’ve just released a four-track EP entitled Bats In The Attic. One of the reasons I described Justin as ultra-friendly is that he and his bandmates have made Bats In The Attic completely free (as in “help yourself to a download or nine”). I think that giving away your music is one of the friendliest things a musician can do. Well, after listening to it (repeatedly) I can state quite categorically that I think those comparisons are moderately misleading. I think that the music on Bats In The Attic is nowhere near as slick-sounding as Teenage Fanclub, not as howlingly arty as Sonic Youth, and it’s not as orchestrally distorted as My Bloody Valentine. Ding! Ding! Ding! We have a winner! Of the four tracks on the EP, this is my favourite by far. This had me bobbing my head in a remarkably short amount of time. (I think it was the chorus that prompted my head to start nodding uncontrollably.) Incidentally, the sound of the guitar in the solo reminds me very much of Midnight Oil. As far as I’m concerned, that is An Incredibly Good Thing. I like this song, but I must warn you that I’m about to make a criticism. It’s not of the song, which I think is fine, but of the EP as a whole. My criticism is this: I think the mastering isn’t as good as it could have been. The volume drop from track 2 to track 3 is mighty unhelpful for the flow of the EP. When this song came on, my first thought was: “Why is this track so quiet?” It’s a song that’s as noisy as the others on the EP, but the overall volume of “Cat Fight” is a whole lot lower than the rest of the EP. Grrr. I just noticed that this post is becoming way too long courtesy of my gibberish. I’ll have to shorten it by using as few words as possible about this track. I’ll use one: “enjoyable”. I’ve listened to it six times now. I think I’ll listen to it again. You are currently browsing the archives for the Origami Hologram category.